The Halo RL Series LED recessed retrofit converts traditional incandescent recessed housings and trims to energy efficient LED fixtures. The retrofit comes with an integrated LED light, heat sink designed for use in a recessed housing, and a die cast white baffle trim. The RL series is rated for air-tight requirements and use in wet locations (i.e. above a shower, etc.). The long lasting LED are tested to last up to 22 years (50,000 hours). This eliminates the need to constantly replace bulbs on high ceilings. This LED retrofit is equivalent to a 60W incandescent bulb, while only using 9W of power. In total, converting your home's recessed lighting to Halo's RL series LED recessed retrofit can save you up to $400 per fixture. 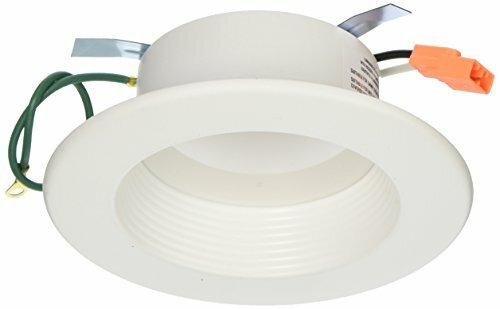 This RL460WH927PK retrofit can fit into most 4" recessed housings. The LED light produces 600 lumens of warm white light with a 90CRI rating.